Warp painting was the next step in the Easy Ikat and Warp Painting Workshop, and this is what I was busy with over the weekend. Other participants had already reported surprise at some of the results they had gotten. So I shouldn't have been surprised that I was surprised with my results as well. 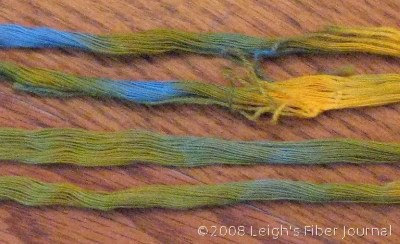 The procedure was basically the same as I used for painting roving (see this post for more on that), except that I this time I was painting cotton yarn instead of wool roving, which meant that I had to use fiber reactive instead of acid dyes. 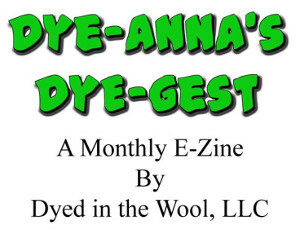 In the workshop notes, Kaz recommended Hands On Dyeing for amounts of the ingredients needed for fiber reactive dyeing, so I'm going to pass on that recommendation to you. The yarns were presoaked in a warm water, salt, washing soda solution, according to the weight of the yarns. 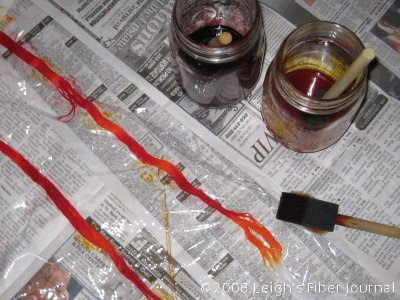 The dyestocks were made up of a 1% solution of dye powder (I used Procion MX) dissolved in water. I painted them on with those little sponge dabber thingies. Excess dye was mopped up and the yarn folded carefully in the plastic wrap it was lying on. These were rolled up and allowed to sit for 24 hours. No steaming required. I did find a warm place to let them batch though. The next day, I thoroughly washed and rinsed them. It definitely has some zing, doesn't it? However I wish I'd used a cooler yellow, because this is not a green I like very well. Besides the color itself, I think that either my warp bouts were still too wet when I started painting, or I got too much dye on them. For example, there are some way too long sections of green in the second set of warps. I'd anticipated shorter sections of color, suitable for a short project like a bookmark. This has been interesting but it leaves me with a dilemma. There is no way I'm going to use those two colorways together. So I have to decide which one to use. Then I'll try to match that with a second round of warp painting. Actually this has been a lot of fun, so I may just keep on painting until I finish off the cone! Pretty colors, looks fun better than putting down hard wood floors. I have a question about the warp. Is this for the Ikat weaving? If so, why didn't you wrap areas not to take up the dye? In your previous post you talked about Ikat weaving and tying sections? Is that just regular ole kitchen plastic wrap you're using? I only know the steaming method, but I knew the plastic method existed and would like to try it sometime to compare results. 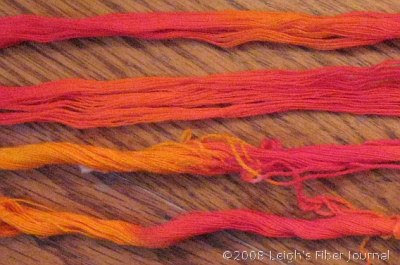 Gert, both warps (ikat warp and painted) will be used in the bookmark. These will make alternating warp stripes. I definitely want to try an all ikat project sometime soon. I also like the look of painted warp, though I might not combine them again in the future. Still, a bookmark like this is a good way to learn both techniques. Rachel, yes, it's just plain old kitchen plastic cling wrap. I believe its the microwavable kind, which I've used to set dye in both the microwave (pre-blog project) and in a dedicated steamer (this post.) Very handy stuff, though it does tend to stick to itself when heat is applied. 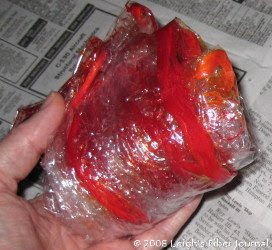 I use Reynold's plastic wrap and I have no trouble with unwrapping it. The colors are glorious! I agree with Peg - the colors rock. Lucky you - you've got two projects launched and more discovery to come. I cannot imagine dyeing cotton. I can hardly handle dyeing wool. I don't see many people, actually no one but you, talking about cotton. I put you in the same camp as my friend Amy - I am always delighted at the way you both push the envelope. That looks great fun Leigh-although of course anything which involves colour looks fun to me! You're way ahead of me! I have wound some warp chains but haven't managed to get them anywhere near any dye yet. These colours are lovely; I'm looking forward to seeing them alongside the ikat. ohmigosh i can't believe you're handling procions without wearing gloves! remember your skin is your bigest and most absorptive organ....ALWAYS wear gloves when handling any synthetic dyes, especially the procions (oh and a mask when mixing the powders is mandatory). i dyed with these ghastly substances 25 years ago, in utter ignorance of their toxicity- material safety data sheets seemed to be unheard of! Tumbleweed, don't panic. I do indeed wear gloves for handling and mask for mixing. Actually however, Procion MX dyes are considered some of the safest on the market; both for the dyer and for the environment. See toxicity of Procion Dyes , toxicity of reactive dye powder, and I'm looking for..... at Paula Burch's website.